As I stare out onto the downtown area of (location TOTALLY redacted…creepos) from the 19th floor of my hotel room, I was struck with inspiration to gush over one of my favorite horror flicks that take place in a big city; Friday the 13th Part 8: Jason Takes Manhattan! 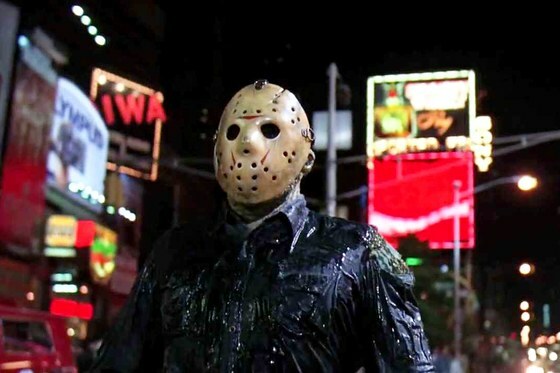 There are plenty of horror flicks that make their way to the big apple but having Jason Voorhees make his bloody mark on this legendary city made this movie EPIC. To be quite honest, I remember as a kid I was a bit skeptical about the premise because the last seven flicks before took place in the iconic campground of Crystal Lake. In my adolescent mind, the legendary hockey – masked killer can ONLY be in a setting where he can pop out from trees and stab through camping tents! I do not know how one of my horror heroes would fare in a more contemporary, trendy environment and since I was a Happy Days fan at that age, I knew where the term JUMPING THE SHARK came from and I was fearful that one of my favorite horror series had done the same. 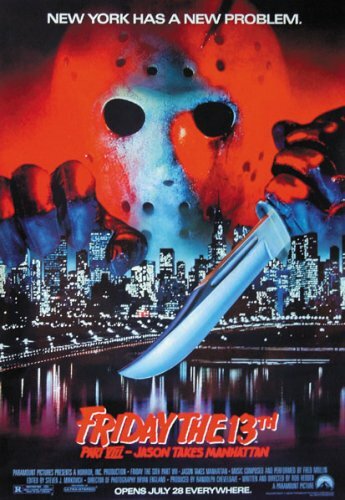 The cover of the VHS tape was already at cheese factor 10, with Jason holding knife over the Manhattan as the familiar font of Friday the 13th sprawled through bottom of the poster. 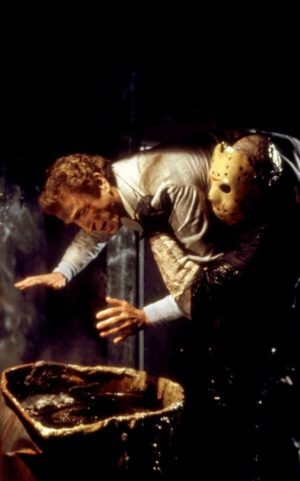 I was intrigued but still a bit apprehensive since the previous flick, Friday the 13th Part 7: The New Blood was one of the FINEST in the series where Jason had to take on a damn telekinetic (CLICK HERE)! I finally got the nerve to rent the actual flick and yes, although strange, there was a different feel to this movie that puts it in my top Friday the 13th flicks! The movie itself does not get to the title’s city until about the third act; most of the flick actually takes place on a yacht that takes a group of teenagers (yes, horny teenagers as usual) to the magical city of NYC. Travelocity really F*cked up this time. 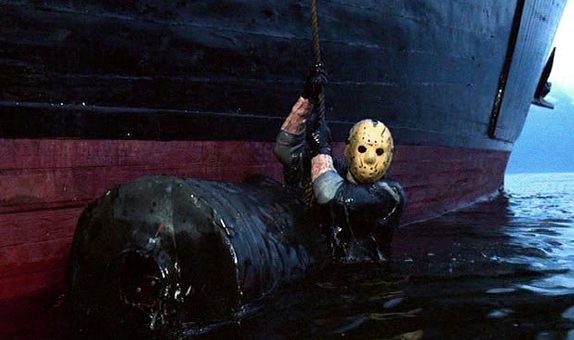 The last time we saw Jason Voorhees; he was under a pile of wood, submerged in Crystal Lake thanks to our telekinetic heroine from the last flick, but somehow the yacht powers up Voorhees’ monstrous corpse and let the horrific shenanigans begin! Jason goes through the yacht causing mayhem until the protagonists make finally make their way to New York. 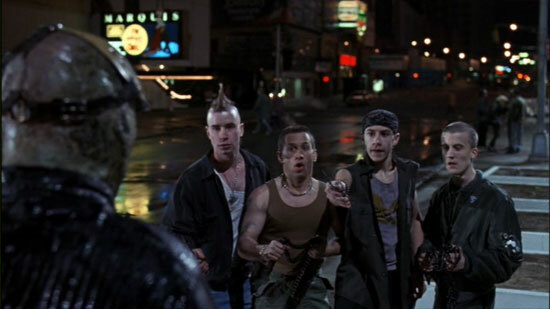 The fact that Jason felt out of place in the big city feel actually worked for this flick because although NYC has a reputation for having parts that one might find dangerous, having a hulking monster slasher barreling through the city seems to be a good fit. What makes this movie great is that whatever it lacks in the classic themes of the other flicks like the outdoors, the tents, cabins, horny teenagers (oh wait, they still have those), it makes up for a bunch of classic scenes that are forever chiseled in the top moments of the Friday the 13th Franchise! You see Jason lurking the sewers of Manhattan and stalking the alleyways with the rats, which feels just as fitting as he does in the shadows of the forest. The movie does not skimp out on the kills either with some of the most creative kills in slasher history. 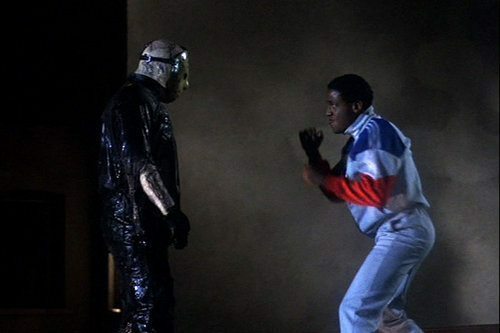 One of the GREATEST slasher scenes of all time involve one of the teenagers challenging Jason Voorhees…to a BOXING match. This has to be one of the most pleasurable horror scenes I have ever witnessed because at first it seems that the young bloke might have a chance! He gets a good chunk of time jabbing, bobbing and weaving through his opponent before it’s finally Jason’s turn. I won’t spoil it here but it ends quickly, decisively and goes down as one of the best scenes in slasher history. Looking out into the downtown area of (*cough cough cough) makes me miss my home and my FearTastic Vault where all my demons, ghosts and ghouls come and play but for a moment, I felt sweet nostalgia as I imagine my old friend Jason Voorhees ripping through a city similar to NYC!